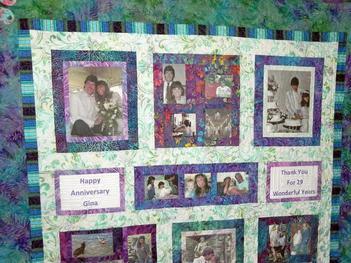 Treese at QuiltNutz created a wonderful anniversary quilt for my wife. Our wedding, honeymoon and family photos incorporated into the quilt made for the best anniversary gift ever! Plus she added a special quilted card to include with the gift. My wife loved it! And I bought myself a set of the reversible bowls! QuiltNutz takes special care to understand the unique needs of each of our clients to design custom solutions that exceed their expectations. We are proud of the work we do and would like to share these testimonials from our happy customers. 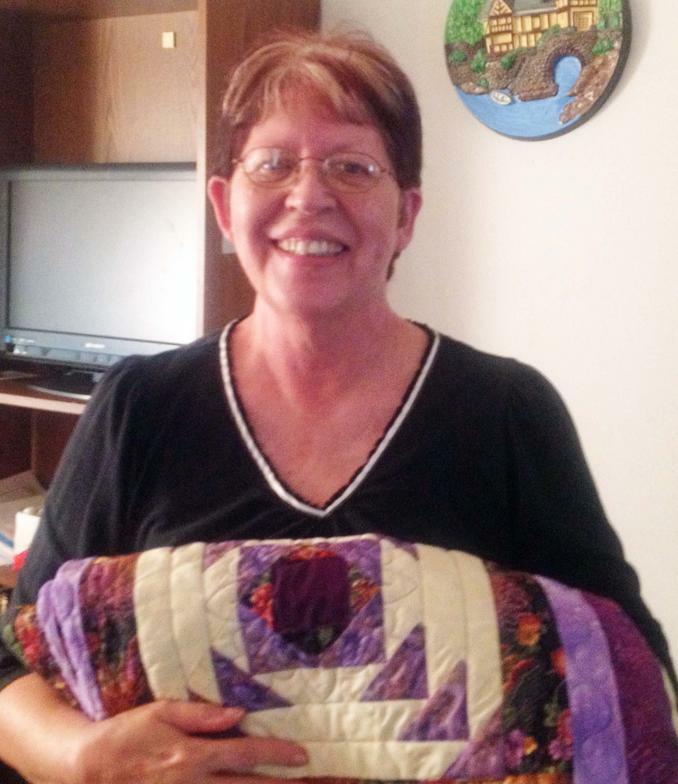 "We presented Emily with her quilt and it was a very heartwarming moment. Emily loved the quilt and thought it was so beautiful. Her eyes lit up because she loved the colors so much......The quilt began at our meetings, with the Ticktockers and Patronesses getting messy, painting their hands and hand printing on the quilt. It traveled to several meetings to ensure everyone had a chance to leave their "love". From there, the quilt traveled to Treese Pflum with Quiltnutz. She helped hand select some quilt colors in Emily's favorite colors and then began to craft the quilt. A month later, it was complete. It turned out more beautiful that any of us can ever imagine. Treese masterfully crafted with rainbow thread and hand stitched hearts the most lovingly crafted quilt imaginable. She even added Emily's name in Quilt Lettering and a personalized label with a special message from her and NCL. Sue M., Billings, Montana and Palm Desert, CA. Love my Rose Quilt Treese created for my wall. It looks terrific on the bed too! 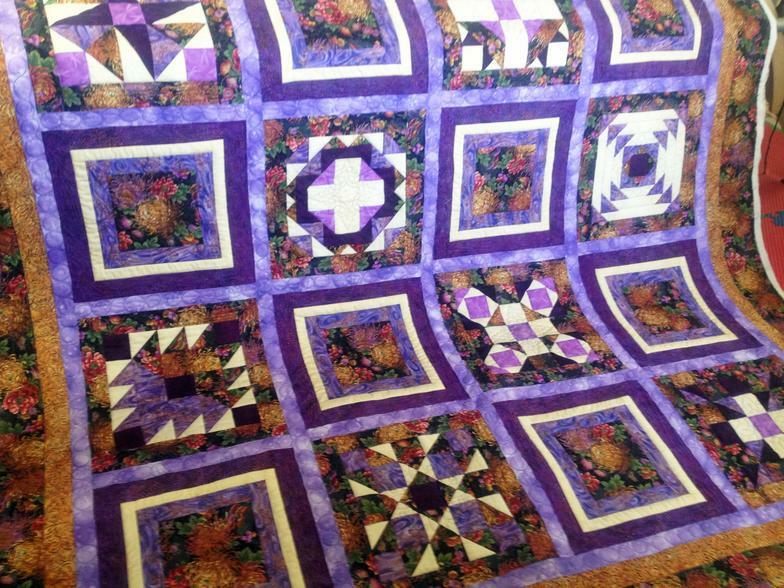 I just adore love this purple sampler quilt Treese made. But I can't decide where to put it --on the bed or hang it on the wall? 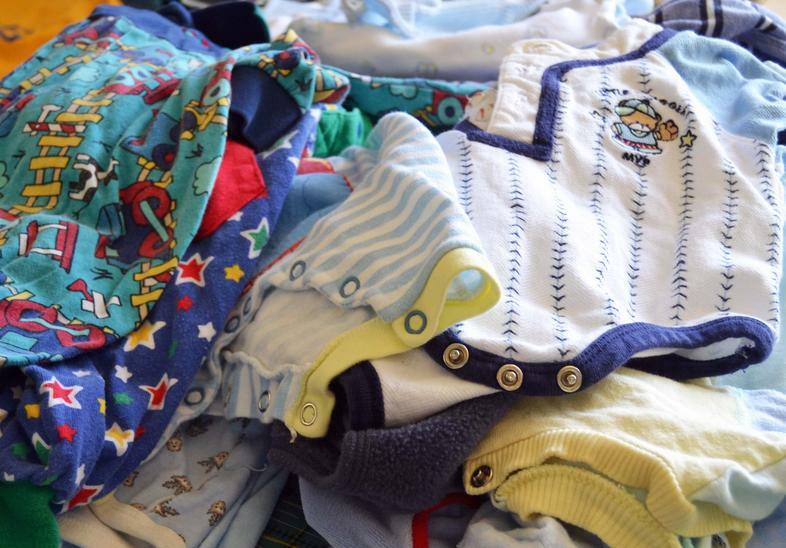 "Thank you so much for the beautiful quilts. The quilts bring back memories of the boys childhood. They are precious and I will love them forever."